Group activity is featured in the article “Researchers Use Machine Learning To More Quickly Analyze Key Capacitor Materials” Visit Georgia Tech News Center to read. James Chapman receives a fellowship for the Computational Chemistry and Materials Science Summer Institute program at Lawrence Livermore National Laboratory. Ramprasad Group moved to Georgia Institute of Technology in February 2018. A new review paper on Polymer Genome is published in Materials Today. Progress in Materials Science and Advanced Materials. To read visit here. A new review paper on machine learning and materials informatics is published in npj Computational Materials. To read visit here. Rohit Batra is featured in the article “Ph.D. Student Seeks to Discover, Design and Develop Better Materials”. Visit here to read. How Professor Ramprasad’s Group is Shaping Materials Discovery. Rohit Batra is awarded GE Graduate Fellowship for Innovation (2017). Arun Mannodi-Kanakkithodi received the MRS Graduate Student Silver Award at the MRS Fall Meeting 2016 for his work and presentation on polymer dielectrics design. Visit MRS NEWS to read. Venkatesh Botu wins the departmental student speaking contest. Venkatesh is also applauded for his inter-departmental and research innovation. Visit IMS NEWS to read. Group activity is featured in the article “Building a Better Mousetrap, From the Atoms Up”. Visit UConn Today, ScienceDaily, Materials Today, and Kurzweil to read. Prof. Ramprasad is elected as a fellow of the American Physical Society (APS). Citation: For pioneering contributions to the computation-driven rational design of materials, especially polymeric and inorganic dielectric materials and catalysts. 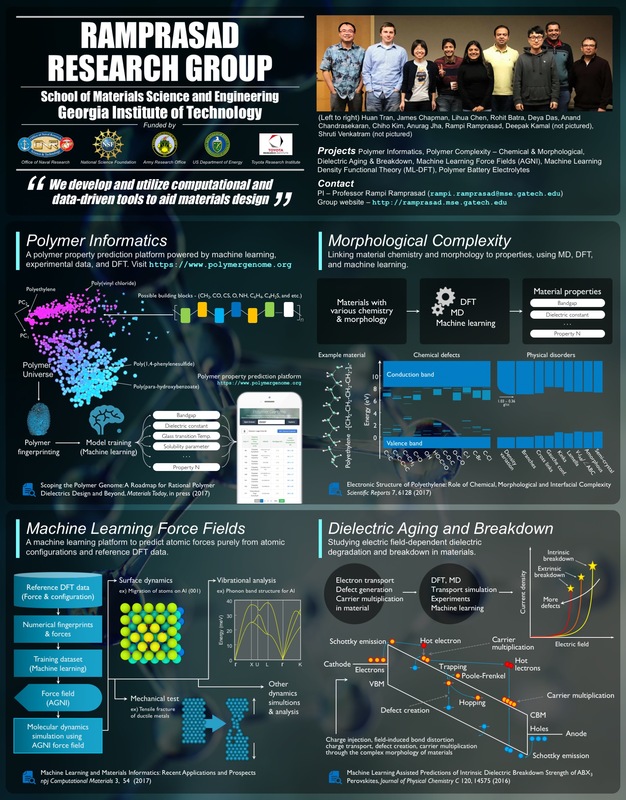 Several papers on machine learning applications in materials science are published, including prediction of the dielectric breakdown field, the dielectric properties of polymers, the band gap of insulators, and the atomic force. “Poly(dimethyltin glutarate) as a Prospective Material for High Dielectric Applications” is published in Advance materials. The paper in its entirety can be read here . “Rational design of all organic polymer dielectrics” is published in Nature Communications. The paper in its entirety can be read here. Prof. Ramprasad receives the 2014 Materials Science & Engineering Award for Teaching Excellence. Chenchen Wang won first place in ASM Harford sponsored 2014 student speaking contest. Vinit Sharma receives a poster presentation award in MRS 2013 Fall meeting. Arun Kumar Mannodi Kanakkithodi is awarded GE Graduate Fellowship for Innovation (2014). Hom Sharma, Chenchen Wang , and Yenny P. Cardona Quintero are awarded doctoral dissertation fellowship (Spring 2014). Prof. Ramprasad receives a grant from the Office of Naval Research for accelerating density functional simulations using machine learning (2013). “Accelerating materials property predictions using machine learning” published in Scientific Reports (September 2013). Click here to see UConn news article. Dr. Ramprasad receives a grant from the National Science Foundation to design inexpensive doped ceria catalysts (2013). Venkatesh Botu receives Kokes Award for the 23rd North American Catalysis Society Meeting (2013). Venkatesh Botu receives 3rd position for Best Poster at 2013 Spring Symposium of The Catalysis Society of Metropolitan New York (2013). Ghanshyam Pilania is presented the 2012 Materials Science & Engineering (MSE) Department’s Outstanding Graduate Student Award (2013). Click here to see UConn news article. Hom Sharma is awarded the 2012 Environmental Protection Agency Science to Achieve Results (EPA-STAR) Graduate Fellowship (2012). Click here to see UConn news article. Satyesh Yadav receives Outstanding Symposium Presentations Award, at Los Alamos National Laboratory Student Symposium (2012). G. Pilania gets Best Poster Paper Prize in 2011 MRS Fall meeting. Dr. Ramprasad (along with Dr. Steve Boggs) is awarded a TPL, Inc. / Air Force STTR grant to study dopants in BaTiO3 (September (2011). Dr. Ramprasad (along with Dr. Ganpati Ramanath) is awarded an NSF grant to design metal-dielectric interface for next-generation “high-k” based devices (January 2011). Hong Zhu is awarded doctoral dissertation fellowship (Spring 2011). Dr. Ramprasad recieves the United Technologies Corporation Professorship for Engineering Innovation (September 2010). Dr. Ramprasad (along with 6 others) is awarded a multidisciplinary university research initiative (MURI) grant by the Office of Naval Research (July 2010). Ghanshyam Pilania is awarded doctoral dissertation fellowship (July-December 2010). Ghanshyam Pilania gets second place in ASM Hartford sponsored 2010 Student Speaking Contest. Satyesh Yadav gets Best Poster Paper Prize in 2010 Connecticut Microelectronics and Optoelectronics Conference. Dr. Ramprasad is awarded the Alexander von Humboldt Fellowship (2009). Chunguang Tang gets a Max Planck Society Postdoctoral Fellowship (2009). Dr. Ramprasad gets the Max Planck Society Fellowship for Distinguished Scientists (2009). Dr. Ramprasad receives the 2009 UConn MSE Teaching Excellence Award. Hong Zhu gets Best Oral Paper Prize in 2009 Connecticut Microelectronics and Optoelectronics Conference. Chunguang Tang gets Chinese government award for outstanding self-financed students abroad. Chunguang Tang chosen as 2008 MRS Graduate Student Award Finalist. Dr. Ramprasad named as the 2008 Outstanding Faculty Member of the UConn MSE Program. Dr. Ramprasad (along with Dr. Steve Boggs) gets a grant from the Office of Naval Research (ONR) to provide computational support for the ONR Capacitor Program (March 2008). Tom Sadowski garners third place in ASM Hartford sponsored 2008 Student Speaking Contest. Dr. Ramprasad is awarded a grant by the National Science Foundation (NSF) to study core-shell II-VI semiconductor nanowires for next-generation photovoltaic materials (July 2007). Chunguang Tang garners third place in ASM Hartford sponsored 2007 Student Speaking Contest. Dr. Ramprasad is awarded a grant by the National Science Foundation (NSF) to perform high-k dielectrics research (March 2007). Ning Shi named as the 2007 Outstanding Graduate Student of the UConn MSE Program. Dr. Ramprasad gets a grant from the Electrical Power Research Institute (EPRI) to study breakdown strengths in polymer nanocomposites (March 2006). Tom Sadowski gets Best Poster Award in 2006 Connecticut Microelectronics and Optoelectronics Conference. Dr. Ramprasad gets a grant from the ACS Petroleum Research Fund to study defect dynamics in Si-HfO2 heterostructures (May 2005). Dr. Lei Zhu (along with Dr. Ramprasad , Dr. Steve Boggs and Dr. Alex Asandei) gets a grant from the Office of Naval Research (ONR) for the development of high energy density capacitors (March 2005).